What Food Do Earthworms Eat? Earthworms are an important species in the food chain for small and medium-sized animals, including birds, fish and raccoons. Earthworms also aerate and help to break down the soil while feeding on smaller organic nutrients. 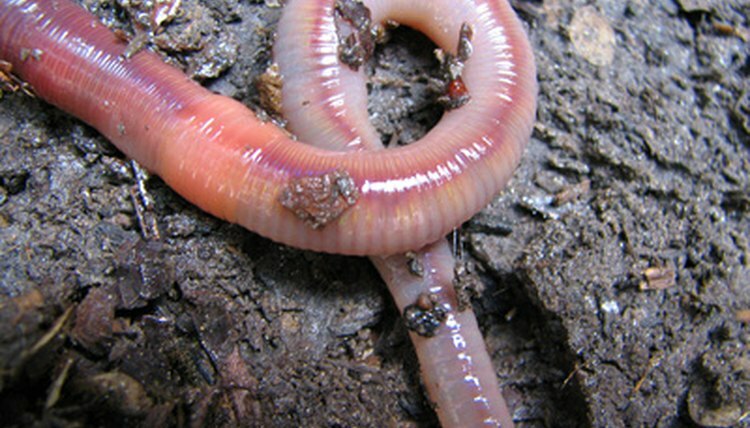 Earthworms eat by ingesting small particles of soil and passing them through their bodies. As the soil passes through the earthworm, the earthworm removes and processes microscopic organisms and nutrients. Earthworms will eat both organic matter and small microorganisms. Earthworms will feed on dead grass and leaves if they are above the surface of the ground. Worms will also feed on fruits, berries and vegetables. However, if they are below ground, they may also feed on algae, fungi and bacteria. If you keep earthworms as pets, you can give them a mixture of vegetable and fruit remains and moist soil. Excrement from earthworms, also known as worm casts, helps to fertilize the soil. Worm casts contain partially digested nutrients, which allows plants to use those nutrients more readily.